Jammin Jars is an online video slot developed by Push Gaming. This can also be seen immediately as the playing field is completely different from the regular slots. The game is a soft deduction from Candy Crush. However, this lock works differently since the symbols can not be moved anymore after turning. In this article we explain the Jammin Jacs slot machine. How does the Jammin Jars slot machine work? This online slot game is played on a game screen with a layout of 8×8. The player gets a win with five or more symbols that are stuck together. Just like the Fruit Blox video slot from Red Tiger Gaming and the Hansel and Gretel slot from NetEnt, the Jamming Jars video slot also uses clusters. The payout percentage here is 96.8%. The game can be played from € 0.20 to a maximum of € 100. This online slot game has a number of nice features and options. We have not yet seen these features in previous slots and therefore certainly unique. Below we explain everything about the features and functions of the Jammin Jar slot machine. The Jam Jar symbol counts here as a wild symbol that can replace any other symbol. When the wild symbol is part of a winning combination, it remains and will move to a random spot before the next cascade takes place. In addition, with each winning combination with the wild symbol, the multiplier is increased by one. After a spin without profit, the Rainbow feature can be activated. As soon as this feature is activated, a rainbow appears on the playing field that will place one or more giant fruit symbols at any location. This feature is not available during the Free Spins. The free spins are activated when three or more Jam Jar (wild) symbols appear on the playing field. The player receives six free spins. During the free spins, three wild symbols remain the entire free spins session. When extra wild symbols are played during the free spins, they will also remain with the other free spins. Symbol value Jammin Jars video slot. The Jammin Jars video slot has six symbols consisting of strawberries, oranges, raspberries, apples, prunes and blueberries. Below the values ​​of the different symbols can be viewed. The values ​​of the symbols can be calculated with: times the amount that is used. So when you play with 1 euro you can multiply the numbers below. The Jammin Jars video slot has six symbols consisting of strawberries, oranges, raspberries, apples, prunes and blueberries. Below the values of the different symbols can be viewed. The values of the symbols can be calculated with: times the amount that is used. So when you play with 1 euro you can multiply the numbers below. Push Gaming has ensured that this online slot machine can be played on any device. This means on the computer, tablet, mobile and other devices with internet. All you need is an online casino with the Push Gaming software. The slot machine will adapt to the resolution of the screen. 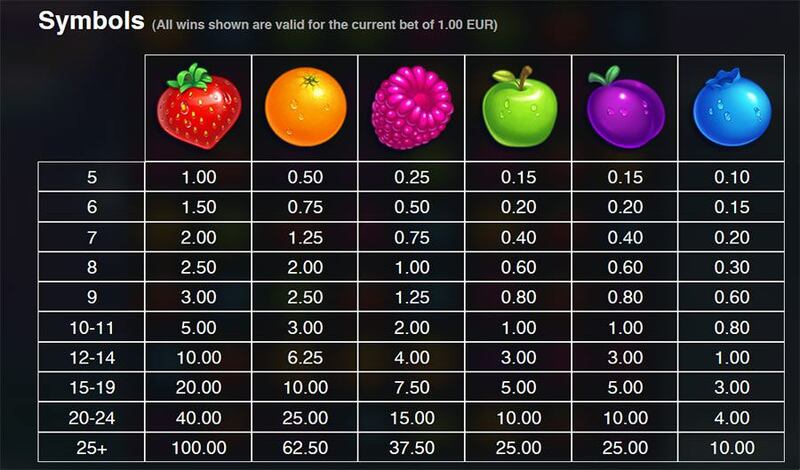 We find this online slot unique with complete own features which makes the game really unique. To make big profits one has to have the multipliers. When you manage to play three or more wild symbols, the game is really exciting. It is really an ‘all-or-nothing’ video slot. We think the Jammin Jars video slot can become popular. At the time of writing this lock was not yet available. So that’s a bit of a wait.